East Village Association | West Town Chicago: Would $50,000 permit stop demolitions? Would $50,000 permit stop demolitions? Rather than lift the liquor moratorium in place, Forbidden Root is pursuing a change in city ordinance that would allow package and carryout sales of their beer as incidental to production onsite. The ordinance has already been introduced to city council and put into committee, so the process is underway – more info to come. Neal McKnight has been working with FR’s attorney, Rolando Acosta, on the C-1 zoning and Plan of Operations. There is a preliminary Plan of Operations being circulated, and some issues such as truck loading still need to be detailed further. McKnight will continue to work with Acosta and present more information to the general membership at the March 3 EVA meeting. In response to EVA’s inquiry into the possibility of a Commercial Park expansion, Fifield has stated that he will not sell the property. Ronda Locke will make a presentation to the Chicago Park District regarding the expansion idea. EVA is still within its agreed upon 90 day period to explore the feasibility of the plan. EVA will post on the website regarding avenues to voice your opinions about the SSA Reconstitution and Expansion. Four public meetings have been held to discuss the issue, and there may be another presentation to the EVA membership. Possible dates are being discussed and will be publicized if it's scheduled. Any comments, questions, concerns, etc can be e-mailed to SSA Program Manager Kace Wakem at kwakem@westtownchamber.org. You can also call her at 312-850-9390. There has been some discussion about this, but it hasn’t been presented yet. We will invite the Ukrainian Village Neighborhood Association to participate in the conversation. The owners asked Neal McKnight for a letter to give to the liquor commissioner stating they presented to EVA in advance. McKnight approves of writing and sending the letter. Gladys Anselmo suggested the bylaws be checked in advance as it suggests a passive endorsement. Others in attendance did not agree that the letter is an endorsement; it is merely a statement of fact. McKnight will check bylaws and send letter if allowed. After a lot of discussion, encouraging preservation of existing stock seems to be a higher priority than focusing on encouraging single-family housing. EVA would like to explore raising the price of demolition, i.e. $50,000 for a demolition permit, to disincentivize people from tearing down structures built after a certain year. The building would also have to be structurally sound. This would be limited to Ward 1 and possibly 2. A proposal to encourage preservation and renovation of existing neighborhood structures will be written up and circulated for the membership to vote on. Neal McKnight has agreed to stay on another year as president. KK Goh has agreed to continue as treasurer. Peter Locke will step down from the vice president position, leaving it open. Meghan Quinn will remain on the board, but no longer as secretary, leaving the position open. Stephen Rynkiewicz will remain on newsletter and website, and will appoint an additional website person as we are changing and updating the website. Scott Rappe will take a hiatus from the board, but will stay on as Planning, Preservation & Development co-chair. Membership will vote at the next EVA meeting on March. Many have requested an easier way to sign up for EVA. The question was raised if we can use anything in addition to PayPal. KK Goh will look into it. Please send any website update ideas to Stephen Rynkiewicz via eastvillagechicago.org. One suggestion was made to include more basic information about EVA on the website, i.e. What is EVA? What do they do? How do you get involved? Another suggestion was to create a bigger difference between the website and the facebook page, as there are a lot of overlapping comments and info on both. Gladys Anselmo pointed to the Portage Park Neighborhood Association webpage as a good example to look at in terms of its organization and information. The suggestion was made that EVA make an effort to reach out to local businesses to become business members. A printed flyer could be a good way to reach out to people at local businesses and events. 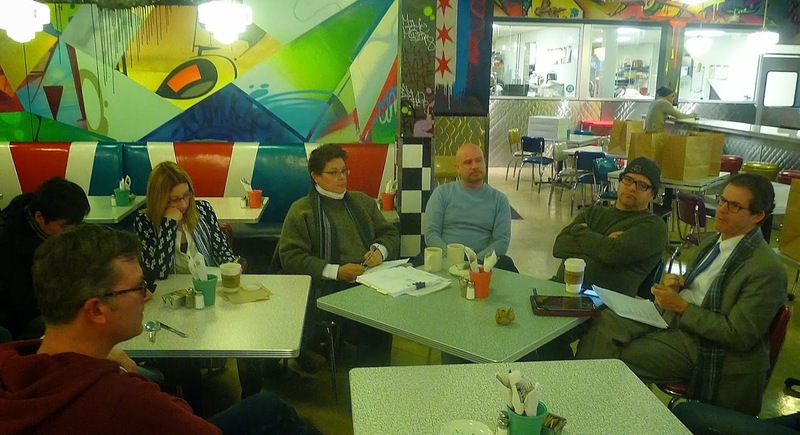 The next general membership meeting will be held at 7pm Monday, March 3 at the Happy Village, 1059 N. Wolcott Ave.
Meeting commenced at 6:35pm, adjourned at 7:33pm at West Town Bakery & Diner, 1916 W. Chicago Ave. Attendance: board members Neal McKnight, KK Goh, Meghan Quinn, Gladys Anselmo, Stephen Rynkiewicz, Rob Schickel, Tom Tomek; other attendees include Rich Anselmo, Alisa Hauser, Michael VanDam.